At 53 feet in length and complete with modern aircraft finishes, AutoPlane, is the first portable airline interior mock-up within the motion picture industry to transport, transform, and roll camera anywhere in North America in as little as two hours. With AutoPlane, film producers will be able to transport, transform, and roll camera of realistic airline content in as little as two hours. Air Hollywood, the world’s largest aviation-themed entertainment studio, today announces the launch of AutoPlane, the motion picture industry’s most cost-effective solution for filming realistic airline content. With AutoPlane, film producers will be able to transport, transform, and roll camera in as little as two hours. 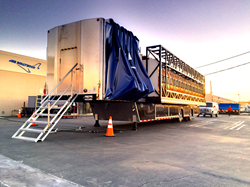 The 53-foot portable airline interior mock-up is available by truck delivery anywhere in North America, and once on location, complete setup takes approximately two hours. By contrast, the Hollywood film industry traditionally relies on stationary or transportable interiors that require complex logistics and assembly manpower. This conventional process consumes significant capital and human resources, and ultimately, strains production budgets. AutoPlane’s innovative design simplifies delivery and installation, and as a result, reduces expenses by up to 85%. Additionally, AutoPlane arrives complete with modern aircraft finishes including economy and first class seating, LiteGear tungsten/daylight LED lighting systems controlled through a DMX board, and instantly deployable emergency oxygen masks for added special effects. As film production markets expand outside of Southern California, AutoPlane’s scale and efficiency enables collaborations on a wide range of projects, large and small, and extends Air Hollywood’s reach to all North America.